The BLIND 2 is the versatile freestyle machine. Coming out of the bag with a 4 line fixed bridle, the BLIND 2 programme is freestyle/freeride, mega loops, massive boost, and great unhook performance. If you want to push your limits into freestyle/wakestyle, you will need to fit the BLIND 2 with the 5th line kit (included). Remove the fixed bridle, and connect the 5th line bar direct to the kite to get a reactive powerful unhook rocket. Using high quality material from TEIJIN, RONSTAN, and COUSIN, and combined with an engineered design, the reinforcements are positioned to deliver high quality products. 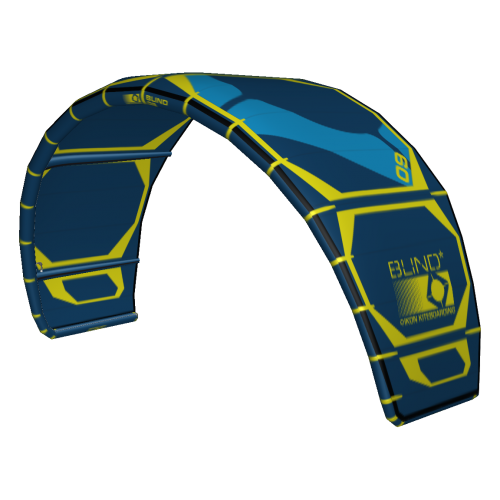 If you don’t want to make a compromise between freeride/freestyle/wakestyle, the BLIND 2 is the kite for you.